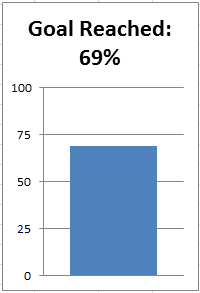 A while ago, a user in an Excel help forum had a chart in his Excel Dashboard that was acting quite strange and he wasn’t sure what the problem was. 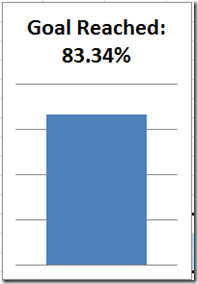 The Excel user was perplexed. 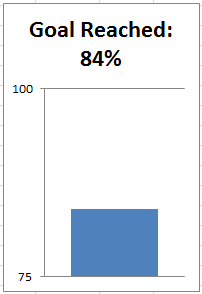 Why was Excel not plotting the chart right? Shouldn’t the bar grow? Instead it looks like it shrunk to less than 50%. He thought it was very strange. 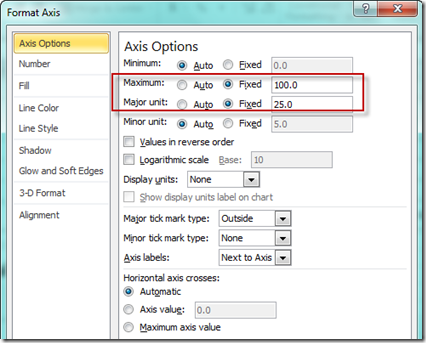 Here is what Excel is doing – “By default, Microsoft Office Excel determines the minimum and maximum scale values of the vertical (value) axis (axis: A line bordering the chart plot area used as a frame of reference for measurement. 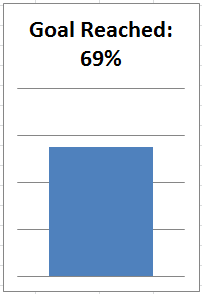 The y axis is usually the vertical axis and contains data. 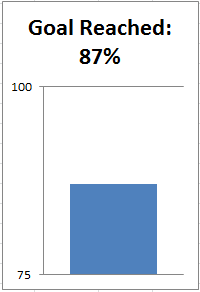 The x-axis is usually the horizontal axis and contains categories. 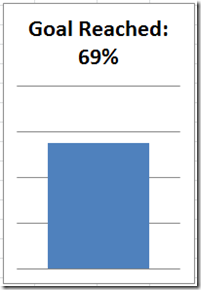 ), also known as the y axis, when you create a chart” – Excerpt from Microsoft Excel Help. 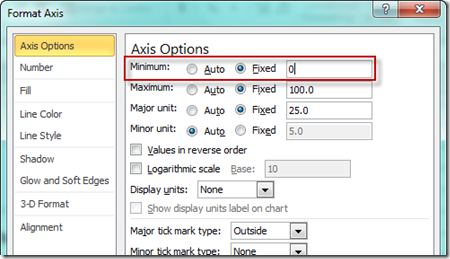 Now what I couldn’t find is the exact calculation that Excel uses to calculate the minimum and maximum scale for the vertical axis. 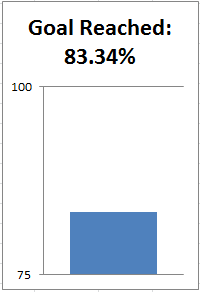 I heard that when all the data points are within about 20% of all values, then Excel will modify your axis. 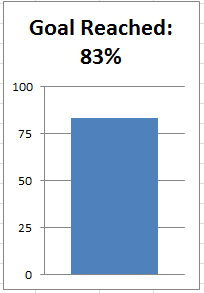 Since we only have one data point, it will adjust the minimum and maximum scale values for the chart on its own. 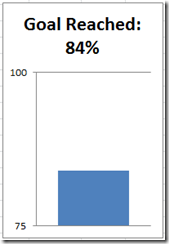 See how Excel changed the chart’s minimum vertical axis value since it was set to Auto? 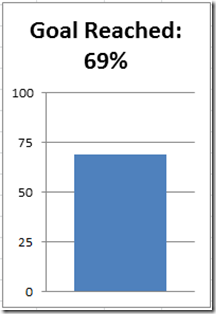 It works for the 69%, but let’s see when Excel changes minimum value. You can do this by changing the values up until Excel changes the vertical axis of the chart. Now lets add more data points and see if that changes it at all. 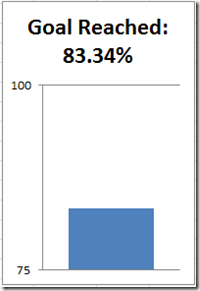 The vertical axis minimum and maximum in this Excel chart is set to Auto. 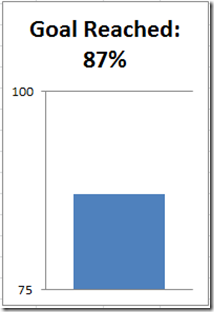 Notice that Excel takes it upon itself to adjust the minimum for this column chart and that is not optimal in most charts as it can add a skewness to your graphic that you don’t want. Now lets change the last data point to to 99.99 and the first data point to 83.33. 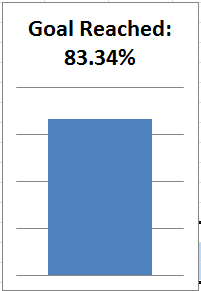 No change in the vertical axis as you can see. The auto function doesn’t affect the minimum vertical axis value anymore because the spread between the data points is more than 16.67%. 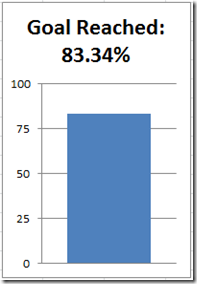 So what was the fix for my friend’s company goal dashboard chart? It was an easy fix in this case. All he had to do was to also fix the Vertical Axis Minimum to equal Zero. 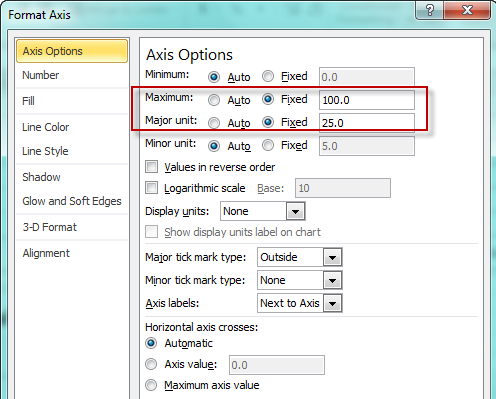 Once you do that, the scale not change and your columns (goal) will always show correctly to the human eye. 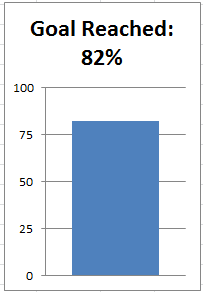 Here is the chart with and without the vertical axis showing and you will see that the bar displays the way we want to see it. Check out the video to watch it in action so that you can fix your Excel charts for your company dashboards. 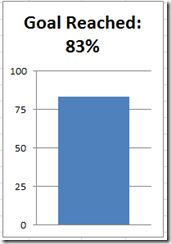 Do you have other chart oddities that Excel creates when making your executive dashboard? Let me know in the comments. Also, don’t forget to subscribe to my blog so that you are sure to get the next post delivered directly to your email inbox. 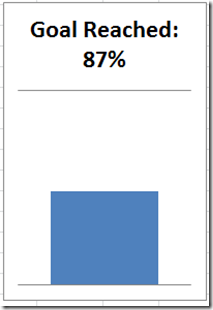 So, how do we fix this problem in Excel 2013? 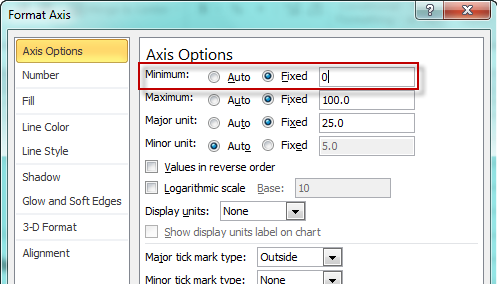 I don’t see an option for making the values set to ‘fixed’. 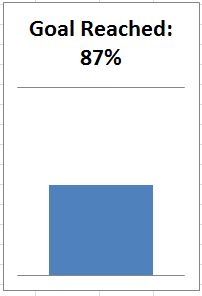 I’ve created a goal bar chart similar to this one… but am being asked to have the color of the bar (fill) change based on the value. Please help!! You can do it with this tutorial but instead of many columns of data, you will only have one.